"While in the Naples, Fl area I was looking for a Pilates trainer to help me maintain and improve my core strength and overall strength and flexibility. 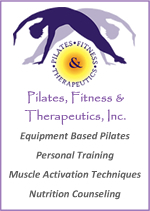 Pilates, Fitness and Therapeutics was the perfect fit and a very professional environment. In addition, knowing that I had a certified athletic trainer with a sports background gave me the confidence and trust which allowed me to make great progress in my conditioning. I would highly recommend Jennifer as an experienced professional trainer who was able to listen and develop a very effective individual program for my needs." This letter is intended to share my experience and opinion of the Pilates, Fitness, and Therapeutics. I have high regard for Jennifer Gerali, who owns and operates this fitness studio. When I discovered Jennifer a year ago, as a new resident to Naples, I had no idea how lucky I was to find such an excellent trainer. Jennifer is not only exceptionally qualified, but she is also dedicated and conscientious, very committed to making certain that you get the attention and the fitness regimen that suits your specific needs. Because of Jennifer’s extensive experience and certification, I have total confidence in her guidance of training exercises. I know that each session will make a difference and keep me free of injury while I work at becoming fit. Jennifer maintains a studio that is clean, relaxing and very private. She has state of the art exercise technology, Pilates equipment, and plenty of space to move about comfortably. I highly recommend Pilates, Fitness and Therapeutics and Jennifer Gerali. Your experience will be gratifying and fun. Both my family and I have benefited from Jennifer’s well-organized personal training programs. What immediately comes to mind is her ability to provide clear instruction and a no- nonsense approach to body awareness and the importance of the nuances of movement. Bodies are fine-tuned and we have learned by her instruction to pay close attention to the body’s dialogue and the responsibility we all have when it comes to maintaining our overall health both in physical exercise and a commitment to nutritional meals. Being an accomplished athlete who has demonstrated excellent self-discipline both in sports and recovery from injuries, you can feel proud that you are respected as a role model. We have been honored to know you for almost a decade. I initially went to Jennifer Gerali for help with chronic lower back pain, hip pain and sciatica pain. Jennifer recommended that we start with the Muscle Activation Techniques (MAT) program. About halfway through the program, I started to notice that my posture improved and I was able to walk without leaning to one side. After completing the MAT program, I no longer have lower back pain or any sciatica pain. A surprising result was that since I now have better range of motion, I’m hitting golf balls about 10 yards further than before the program. I would recommend the MAT program to anyone who is interested in restoring their bodies. Thanks to working with Jennifer in her Pilates sessions, I have never achieved such strength in my legs following a biking accident a decade ago. It has also significantly enhanced my flexibility and changed my body shape.